Jarwin finished the regular season with 27 catches on 36 targets for 307 yards and three touchdowns. 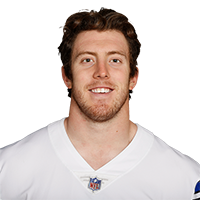 Jarwin (ankle) is active for Saturday's divisional-round game against the Rams, David Helman of the Cowboys' official site reports. Analysis: With a high-ankle sprain in tow, Jarwin was subject to a pregame workout, which included work on resistance cords, according to Jon Machota of The Dallas Morning News. It went well enough for Jarwin to gain clearance to suit up, but his snap count may be tied to pain tolerance. If Jarwin's workload is diminished, Dalton Schultz and Rico Gathers are available to pick up the slack. Jarwin (ankle) is expected to be active Saturday versus the Rams, Jay Glazer of Fox Sports reports. Analysis: The Cowboys won't make it official until they post their inactive list 90 minutes before Saturday's 8:15 PM ET kickoff. However, Jarwin appears to have passed the requisite tests during his pregame workout. Jarwin (ankle) will participate in a pregame warmup with an expectation that he'll be active for Saturday's wild-card contest with the Rams, Adam Schefter of ESPN reports. Analysis: After emerging from the Cowboys' wild-card win against the Seahawks with a high-ankle sprain, Jarwin was held out of every practice this week. Subsequently, his availability for the second round was up in the air, but he appears to have a better chance to suit up than Cole Beasley, who has the exact same injury. Jarwin's status will become known about 90 minutes before Saturday's 8:15 PM ET kickoff. Jarwin (ankle) is listed as questionable for Saturday's divisional-round contest against the Rams, David Helman of the Cowboys' official site reports. Analysis: Like veteran wide receiver Cole Beasley, Jarwin is tending to a high-ankle sprain, which held both players out of practice all week. Helman is of the belief Jarwin will be a game-time decision, which likely means the tight end's availability won't be determined until approximately 90 minutes before Saturday's 8:15 PM ET kickoff. Jarwin is recovering from a high-ankle sprain, Clarence E. Hill Jr. of the Fort Worth Star-Telegram reports. As a result, Jarwin missed practice Tuesday and Wednesday. Analysis: With the extent of Jarwin's ankle injury clarified, it's no surprise the tight end hasn't stepped foot on the practice field this week. 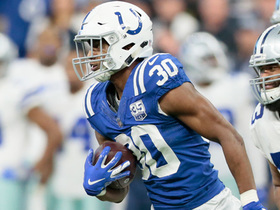 He also may struggle to play through the sprain Saturday against the Rams, something that could be confirmed as early as Thursday, when the Cowboys release their final practice report ahead of the divisional-round matchup. If Jarwin doesn't suit up this weekend, fellow tight ends Dalton Schultz and Rico Gathers are poised to benefit. Jarwin (ankle) didn't practice Tuesday, Jon Machota of The Dallas Morning News reports. 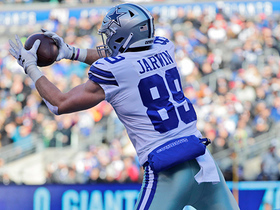 Analysis: Jarwin has come on strong since taking over the largest share of snaps afforded to Cowboys tight ends, posting 26 catches (on 31 targets) for 280 yards and three TDs over the last seven games, including playoffs. Granted, most of that production came in a 7-119-3 performance against the Giants in Week 17, but an ankle injury now is threatening his standing. Practice reports Wednesday and Thursday could be enlightening for his potential workload in Saturday's wild-card game versus the Rams. Jarwin isn't scheduled to participate in Tuesday's practice due to an apparent ankle injury, Calvin Watkins of The Athletic reports. 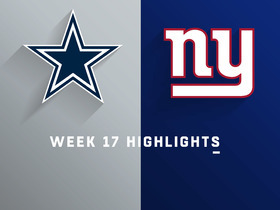 Jarwin caught seven of eight targets for 119 yards and three touchdowns in Sunday's 36-35 win over the Giants. Jarwin caught two of three targets for eight yards during Sunday's 27-20 win over Tampa Bay. Analysis: Jarwin came into Sunday with back-to-back games with seven targets. He couldn't keep that going against a pretty weak Buccaneers pass defense as the Cowboys dinked and dunked their way to a win. Jarwin's value continues to depend heavily on the health of Geoff Swaim (wrist). If he gets the start in the finale, he'll have a chance to take advantage against a solid Giants pass defense against which Jarwin was held catchless in Week 2, albeit in a supporting role. Jarwin is expected to act as the Cowboys' No. 1 tight end Sunday against the Buccaneers with Geoff Swaim (wrist) sidelined, Jon Machota of The Dallas Morning News reports. 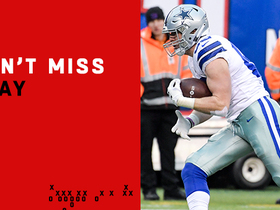 Analysis: Swaim will miss his fifth game in a row, affording Jarwin another opportunity to build off his impressive showings over the past two weeks. Jarwin has drawn seven targets in back-to-back contests, hauling in 11 of those throws for 101 yards. If he can maintain that kind of volume Sunday, he'll make for a decent streaming option at tight end, albeit a low-upside one. Only one of Jarwin's 25 targets this season have come in the red zone, leaving him still in search of his first NFL touchdown. 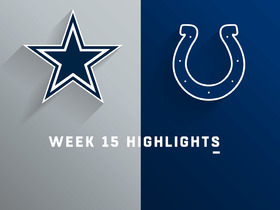 Jarwin caught four of seven targets for 45 yards during Sunday's 23-0 loss to the Colts. Analysis: Jarwin tied for second on the team in targets and led the way in receiving yardage. He hadn't topped two catches or 25 yards in any game this season prior to last week, but he now has 11 catches for 101 yards combined over his last two outings. Jarwin will look to continue his recent success in a favorable matchup against the Buccaneers next Sunday, but Geoff Swaim's (wrist) potential return would squash any hint of optimism that he can rise above an already crowded tight-end picture. Jarwin caught all seven of his targets for 56 yards during Sunday's 29-23 win over the Eagles. 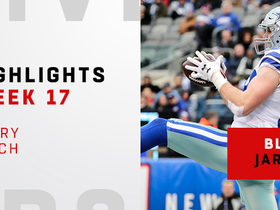 Analysis: The second-year tight end doubled his career reception total during Sunday's outing, in which Dak Prescott surpassed his previous career high in passing yards by a whopping 123. Dallas' offense runs through Ezekiel Elliott and, though Prescott has been efficient as of late, don't expect another passing outburst Sunday against a Colts defense significantly tougher compared to the Eagles. Also, Geoff Swaim (wrist) may return. Jarwin caught both of his targets for 15 yards during Monday's 28-14 loss to the Titans. Analysis: With Geoff Swaim (knee) out, Jarwin was the only Dallas tight end to catch a pass. That says two things: (1) Jarwin is the tight end to have in Dallas while Swaim is out, and (2) with just 15 yards, that doesn't mean you should have him. Jarwin is not fantasy-relevant at this point, even Sunday against a weak Philadelphia defense surrendering 269 passing yards per game. 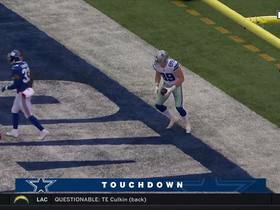 Dallas Cowboys tight end Blake Jarwin notches his third touchdown with 39-yard run after the catch. 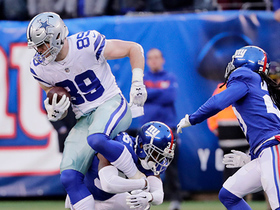 Watch every Dallas Cowboys tight end Blake Jarwin catch from his breakout game in Week 17 against the New York Giants. Dallas Cowboys tight end Blake Jarwin contorts for a 30-yard grab. 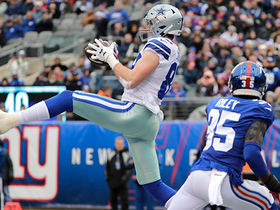 Dallas Cowboys tight end Blake Jarwin carves the New York Giants defense for his second touchdown reception. 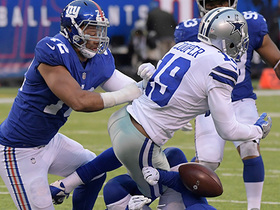 Dallas Cowboys tight end Blake Jarwin finds hole in the New York Giants' defense for his first career touchdown catch. Indianapolis Colts safety George Odum intercepts a pass by Dallas Cowboys quarterback Dak Prescott.